Penelitian - Scientists from Chinese mainland and Hong Kong are working together on a space telescope to search for the mysterious dark matter in galaxy clusters about 300 million light years away. The space telescope, with a detector like the eye of a lobster, has been named HKU No.1 and is expected to be sent into space in 2019. It is a joint project of the University of Hong Kong (HKU), Nanjing University, Beijing Institute of Space Mechanics and Electricity under the China Academy of Space Technology and two commercial space companies in Beijing. Inspired by the structure of a lobster eye, U.S. scientists invented the focusing technology in the late 1970s. Its biggest advantage is its wide-angle vision. Many laboratories around the world have made lobster-eye probes to detect X-rays in space, but none has been sent into orbit. Su Yun, director of the R&D center at the Beijing Institute of Space Mechanics and Electricity, said the institute to develop a lobster-eye X-ray focusing detector in 2013 and made breakthroughs in the core technology at the end of 2015. In 2016, HKU and other organizations supported the application of the technology in space astronomy. Astronomical observations show all the known matters account for only about 5 percent of the universe, while 95 percent of the universe is made up of dark matter and dark energy. Regarded as the two "dark clouds" over the 21st Century physics, dark matter and dark energy are at the frontier of basic physics and cosmology. China launched the Dark Matter Particle Explorer (DAMPE), nicknamed Wukong or Monkey King, at the end of 2015 to detect the high-energy electrons and gamma rays in space, which might be generated in the process of annihilation or decay of dark matter. "If we compare the signals that DAMPE is looking for as the 'prime suspect' of dark matter, then our lobster-eye telescope is going to investigate another 'suspect' which is the sterile neutrino," said Su Meng, deputy director of the HKU Laboratory for Space Research. 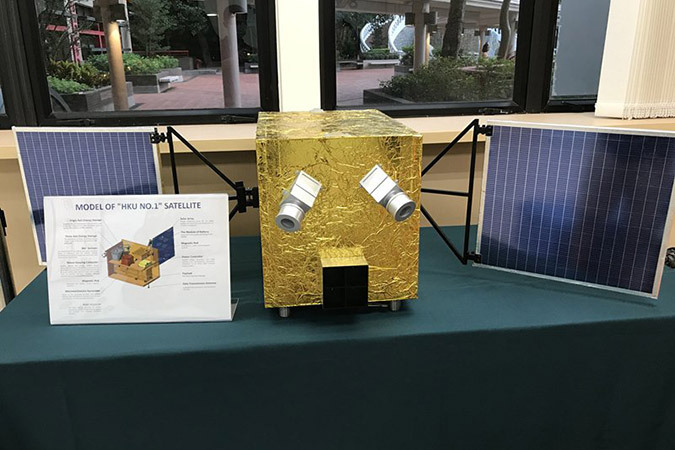 The satellite will also be used to study the hot gas in rich galaxy clusters, observe comets in the solar system and explore the interaction of the solar wind with the earth's magnetosphere, said Su Meng. Quentin Parker, associate dean of the HKU faculty of science, said the broad mission scope is highly interdisciplinary. It effectively combines the fields of astronomy, earth science and planetary science. The potential science dividend and impact of this satellite are cutting edge. Parker said the mainland's significant investment in missions to the moon, Mars and the upcoming space station will provide important opportunities for Hong Kong-based scientists. The HKU Laboratory for Space Research would launch various bids for mainland funding and to access the research environment. HKU is pumping 10 million HK dollars ($1.28 million) into building a new space research laboratory in Hangzhou. The lab will fund the work of two postdoctoral fellows from top mainland institutions, including the Kavli Institute for Astronomy and Astrophysics at Peking University and Nanjing University. Parker has also been appointed as an adjunct professor at Zhejiang University, which has the mainland's pre-eminent microsatellite research group. The HKU lab and the three top mainland universities will strengthen cooperation in astrophysics, space science and satellite technologies.